Recognised efficacy for metabolic disorders. Used for treating chronic diarrhoea, stress, ageing, memory problems and loss of appetite. Our dietary supplement Benfotiamine is a potent allithiamine, a group of thiamine (vitamin B1) derivatives. Compared with thiamine, benfotiamine has a highly specific structure which offers benefits for our health. For example, studies show that it passes more easily through cell membranes more easily, remaining in the body for longer, and thus giving it excellent bioavailability. Benfotiamine is therefore often presented as a bioavailable and absorbable form of vitamin B1. Vitamin B1 is also a precursor of thiamine pyrophosphate or TPP, a coenzyme essential for the activity of certain decarboxylase enzymes. Thiamine cannot be produced or stored by the body, so as with all vitamins, it must be obtained from an external source. The recommended daily amount, estimated to be around 1.5g for adults, therefore has to be met through the diet. Foods rich in vitamin B1 include brewer’s yeast, nuts, wholegrains and offal but while these are excellent sources, thiamine is a water-soluble, heat-sensitive vitamin which is easily destroyed during preparation and cooking. Hence the development of thiamine supplements which protect the vitamin and provide an optimal intake. Delivered in capsule form, these supplements preserve the vitamin’s quality until it is absorbed by the body. Given the importance of vitamin B1 to our health, our dietary supplement Benfotiamine has been specifically formulated to prevent the risk of deficiency. Inadequate intake or poor absorption of the vitamin can lead to deficiency and subsequent health problems. A lack of vitamin B1 is particularly common in alcoholics, people suffering from chronic intestinal diseases or acute infections, those taking diuretics or those who eat a lot of carbohydrates. In the absence of sufficient B1, deficiency can manifest in loss of appetite, weight loss and fatigue. In more serious cases, thiamine deficiency can trigger diseases such as beriberi. This is characterised by neurological impairment with reduced mental capacity, mobility problems, disturbed balance and even psychosis. Supplementing with benfotiamine can thus prove vital in preventing deficiency in vitamin B1. the treatment of chronic diarrhoea. 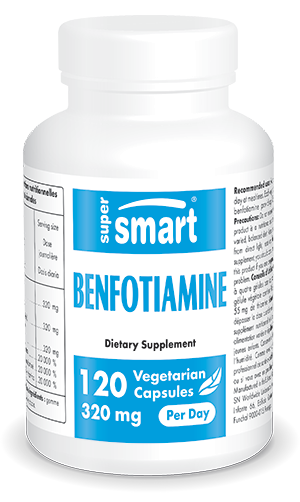 Our benfotiamine supplement has been developed to provide an optimal level of vitamin B1. Each capsule contains 80mg of benfotiamine, providing 55mg of elemental thiamine, with a suggested dose of 2-4 capsules a day to be taken with meals. This dose can, however, be adjusted in line with your needs and the advice of your therapist. In addition to vitamin B1, you may also be interested in benefiting from the effects of other B complex vitamins such as vitamin B3, vitamin B6 and vitamin B12. Take two to four vegetarian capsules a day at mealtimes or as advised by your therapist. Each vegetarian capsule contains 80 mg benfotiamine providing 55 mg elemental thiamine.